BVI athletes, Iowa Central College’s Akeem Bradshaw, left; Tarique Moses of Central Arizona College, Iowa Central College’s Nelda Huggins and Adriano Gumbs of Barton County Community College at the National Junior Colleges Athletics Association Indoor Championships in Lubbock, Texas. Long Jumper Akeem Bradshaw of Central Iowa College, became the territory’s 11th individual Jr. College All American, when he placed second in the event at the National Jr. Colleges Athletics Association Indoor Championships in Lubbock, Texas on Friday. Ralston Varlack, competing for Central Arizona College became the BVI’s first Jr. College All American, also in the Long Jump, in 1996. Six different athletes have become All Americans for their performances since 2014. Bradshaw’s teammate Nelda Huggins, was second in women’s 60-meters dash as well, to earn All American Honors. Competing in flight two, Bradshaw opened with a leap of 7.03m (23’0¾”). He then moved into third place with 7.25m (23’9½”) effort, before falling into fourth. In the third round when the medals were decided, he climbed into second place behind Barton County College’s Travis Hagg’s 7.48m (24 6½”) jump, with a personal best leap of 7.44m (24’ 5 inches). 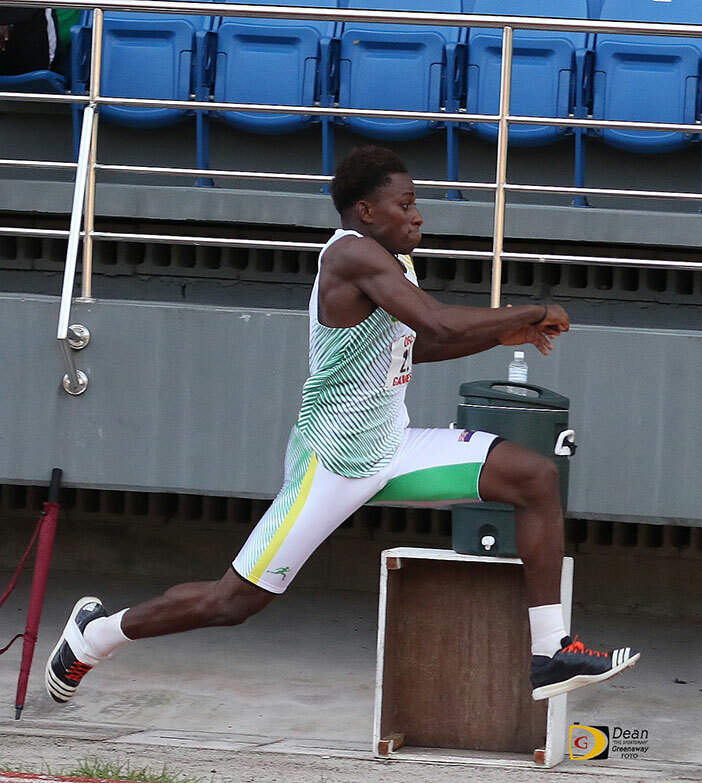 On Saturday, he turned his attention to the Triple Jump, where he entered the competition with a season’s best of 14.75m (48’ 4¾”). After fouling his first attempt, he then cut the sand at 14.57m (47’9½”), climbing into eight place where he would finish after fouling his next four attempts. Bradshaw said he has problems in the Triple Jump after Long Jumping. 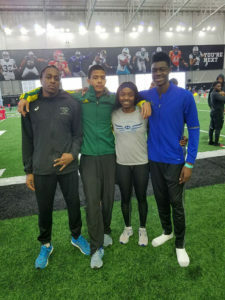 Meanwhile, Huggins, who had a season’s best of 7.40 seconds heading into the championships, made her intentions known she would be competing to defend her title by winning her 60-meters heat with the fastest time in the prelims of 7.37 seconds. She placed second with a time of 7.42 seconds. Huggins, who was second overall last year, was second in her 200-meters heat in 24.16 seconds. She finished fifth in 24.15 seconds. She did not respond for comments on her performances. Also in action was Central Arizona College sophomore Tarique Moses. He was 12th in the 600-meters heat in a personal best of 1 minute 21.38 seconds but did not advance to the final. Barton County College’s Adriano Gumbs, was 18th in 1:22.15. Gumbs earned All American honors as part of his team’s 4 x800m relay, after they placed fifth in 7 minutes, 50.60 seconds. Moses earned his All American honors on his team’s 4x400m relay, that was seventh with a time of 3 minutes, 13.97 seconds. Elsewhere, at the Cal State LA Invitational, Beyonce DeFreitas won the women’s 200-meters in 24.02 seconds after finishing third in the 100-meters dash in 12.01 seconds. 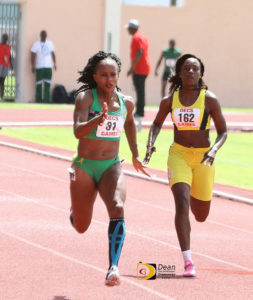 Tarika Moses was second in 24.50. 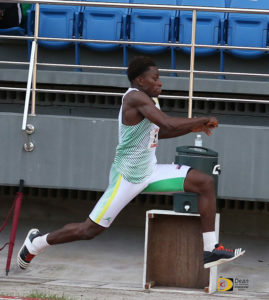 Moses won the 400-meter in 56.67 seconds. In Florida, Plantation High School junior Chaz Fahie placed fifth in the Hallandale Invitational varsity boys 800-meters, with a time of 2 minutes, 03.32 seconds. Competing in the South Cobb High School meet, middle schooler Adaejah Hodge of the BVI, won the 11-12 girls 100-meters dash in 12.90 seconds, running for the Legacy Athletics Club. Her 27.64 seconds was good for third in the 200-meters and she cleared 1.27 meters (4 feet 2 inches) to win the high jump. Meanwhile, in her fifth and final IAAF World Indoor Championships after two finals berths—including a 2008 bronze medal—followed by two semifinal placings, Tahesia Harrigan-Scott did not advance for the first time in five appearances. She was sixth in her 60m heat in 7.50 seconds—well off her 7.31 seconds season’s best. “My indoor season took a bit to come around but I was satisfied with my progression leading up to Worlds and felt very confident about my race,” Harrigan-Scott said afterwards. “My race was lost from the beginning, which is usually my strength. I didn’t react like I usually do but by drive phase was lost trying to avoid going into lane six. Instead of pushing during my drive, I was spinning my wheels trying to stay in my lane and stay with the pack. After that, it was just a result of what did or should I say, didn’t do at the beginning. As she closed her indoor chapter, Harrigan-Scott said he’s satisfied and fortunate to have competed in five World Indoor Championships during her career.